In its Concluding Observation on Thailand in March 2017, the UN Human Rights Committee has expressed its concern about the enforcement of the Head of the NCPO Order no. 3/2558 and recommended that Thailand guarantee the right to freedom of expression. 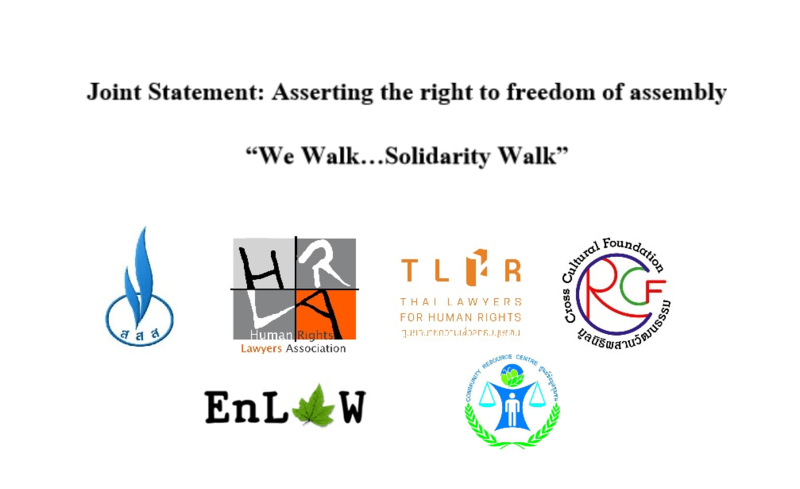 The restriction or prohibition of the organization of the “We Walk…Solidarity Walk”, which is an exercise of the right to freedom of expression and peaceful assembly is therefore not in compliance with Articles 19 and 21 of the International Covenant on Civil and Political Rights (ICCPR) to which Thailand is a state member. The 2015 Public Assembly Act aims to ensure the availability of public space regardless of the types of public assembly. Officers at the KlongLuang Police Station are competent officers overseeing public assembly. They have the mandate to oversee and protect the exercise of the right to public assembly in the area under their jurisdiction and they cannot deny their obligation to act according to the “duties” specified in the 2015 Public Assembly Act. Issued by invoking Section 44 of the 2014 Interim Constitution, the Head of the NCPO Order no. 3/2558 allows competent officers, without liability, to use their discretion to broadly determine the definition of a public assembly or an illegal assembly. Such draconian law has paved the way for the authorities to clamp down on and violate the aforementioned rights, unnecessarily and disproportionately. The undersigned human rights organizations reiterate that the Head of the NCPO Order no. 3/2558 is in contravention of Sections 34 and 44 of the 2017 Constitution of the Kingdom of Thailand which upholds the exercise of the right to freedom of expression and assembly and in breach of the rule of law that requires checks and balances. An attempt to collect signatures of constituents is an exercise of direct rights by the people and prescribed by Section 133(3) of the 2017 Constitution of the Kingdom of Thailand. It is not am illegal assembly or a political assembly which could contravene Article 12 of the Head of the NCPO Order no. 3/2558. By invoking a ban on political gathering against “We Walk…Solidarity Walk”, it will simply intensify the climate of fear in the public. In addition, it attests to the unabated attempts to crack down on people’s rights and freedoms and it demonstrates how important it is to collect signatures of the people to have the political gathering ban annulled. With the above reasons, the undersigned human rights organizations demand the authorities stop invoking the Head of the NCPO Order no. 3/2558 and respect the right to freedom of expression and peaceful assembly. The authorities are also urged to support the organizers of the event, participants and general public as prescribed for in the 2017 Constitution of the Kingdom of Thailand and the 2015 Public Assembly Act.